PHOTO: Montgomery County Community College and Ursinus College signed a transfer articulation agreement on Dec. 3. 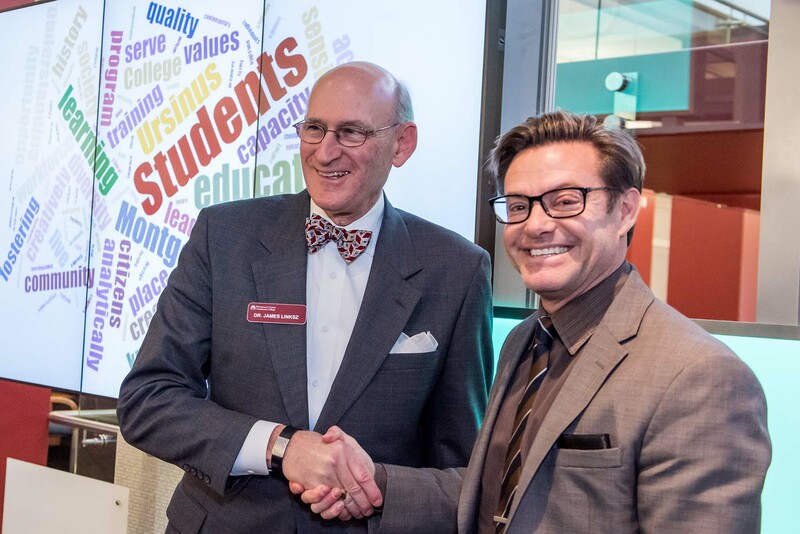 Pictured, James Linksz (left), MCCC Interim President, and S. Brock Blomberg, Ursinus President, shake hands following the signing. Photo by Sandi Yanisko. Blue Bell, Pa.—Montgomery County Community College (MCCC) graduates can now count Ursinus College (Ursinus) among their seamless transfer options, thanks to a new transfer articulation agreement signed by college officials on Dec. 3. The agreement encourages and facilitates the transfer of qualifying MCCC graduates to Ursinus, located in Collegeville, Pa., to complete their baccalaureate degrees. Under the agreement, MCCC students who graduate with Associate of Arts (A.A.), Associate of Science (A.S.), Associate in Fine Arts (A.F.A. ), Associate in Applied Science (A.A.S.) or Associate in General Studies (A.G.S.) degrees and have a 3.0 grade point average (GPA) may transfer to Ursinus with junior status, given they meet Ursinus admissions requirements and complete a transfer admissions intent form prior to applying. While MCCC’s graduates have successfully transferred to institutions across the country and world, building formal relationships with select colleges and universities streamlines the transfer process. These partnerships also introduce students to transfer destinations they may not have considered, such as select liberal arts institutions like Ursinus. This transfer agreement is not the first time the two institutions have collaborated. Over the summer, two MCCC STEM students—Sean Heron, of Royersford, and Rachel Simon, of Bensalem—participated in Ursinus’ Pilot Program for Community College Research, where they worked on original research projects alongside teams of Ursinus students and faculty mentors as part of the institution’s competitive Summer Fellows program. The latest agreement is the fifth between MCCC and a highly selective institution; other such partners include Bucknell University, Bryn Mawr College, Dickinson College and Lehigh University. In total, MCCC has transfer agreements with close to 60 colleges and universities. MCCC is Ursinus’ first formal community college partner. To learn more about transfer opportunities at MCCC, visit mc3.edu/student-resources/transfer-services/transfer-agreements. Ursinus College is a highly selective, residential college with 1,650 students that is widely recognized for its Common Intellectual Experience. Founded in 1869, Ursinus is an undergraduate liberal arts institution that provides a rigorous curriculum that empowers the intellect, awakens moral sensitivity and challenges students to improve society. The tree-lined, 170-acre campus abounds with sculptures and artwork, and is located in Collegeville, Pennsylvania. For more information, visit ursinus.edu. Montgomery County Community College offers a comprehensive curriculum of more than 100 degree and certificate programs, a Virtual Campus, a Culinary Arts Institute, a Municipal Police Academy, and specialized workforce development programs, all of which leverage the College’s nationally ranked use of innovative technology. An Achieving the Dream (AtD) Leader College, the institution is positioned at the vanguard of national efforts to increase completion, improve learning outcomes, and remove barriers to access for more than 24,000 students annually. The College is also recognized regionally and nationally for its sustainability leadership, work with military veterans, and community service and service learning opportunities. Visit mc3.edu or join us on Twitter @mccc. Blue Bell, Pa.— Montgomery County Community College (MCCC) and Kutztown University (KU) signed a “reverse transfer” agreement on Aug. 20—the first agreement of its kind between a community college and a Pennsylvania State System of Higher Education (State System) university. Under the new agreement, students who complete at least 15 credits at MCCC now have the opportunity to transfer credits they earn at Kutztown back to Montgomery in order to earn an associate’s degree in a parallel field en route to earning a bachelor’s degree. According to MCCC President Dr. Karen A. Stout, the agreement builds on Montgomery’s strategic efforts to increase student access, progression and completion rates, and on work being done nationally to support community college degree completion. Close to 70 percent of MCCC students enter the College each year with the intention to transfer to a four-year institution, and Kutztown is a popular choice. In fact, last year, 182 of the College’s students transferred an average 44 credits to KU. The institutions’ leaders envision that the new agreement will serve as a model partnership for Pennsylvania community colleges and State System institutions. MCCC and KU are not strangers to such innovation; in 2007, Montgomery became the first community college with which Kutztown signed a dual-admissions and core-to-core transfer agreement. Blue Bell/Pottstown, Pa.— A total of 1,491 students graduated from Montgomery County Community College with 1,525 associate’s degrees and certificates during the 47th Commencement ceremony on May 15 at the Central Campus, 340 DeKalb Pike, Blue Bell. The 2014 graduates are listed by area of residence.